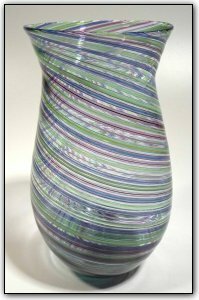 This lovely vase features many shades of blues, greens, and purples. It was made from hand pulled cane, which is a two-stage time consuming process. First Dirwood hand pulled the canes used to make this vase, then he made the vase using those canes. Make sure to check out the view from the top, where everything comes together in the most beautiful swirl!